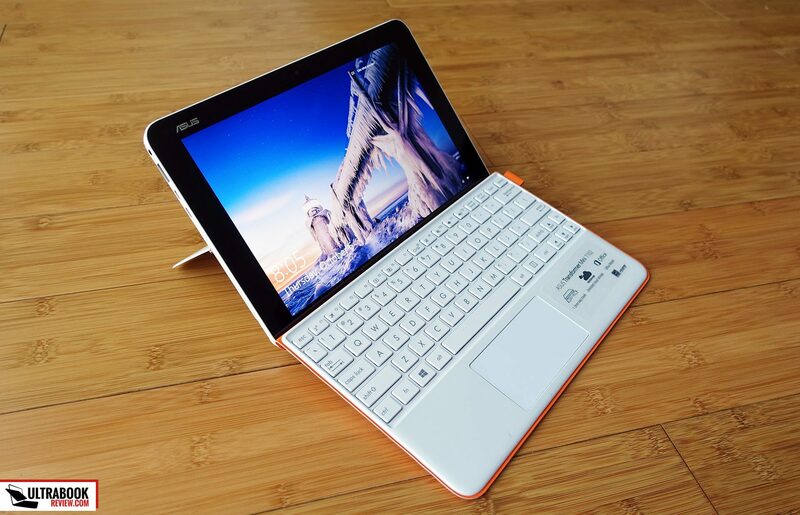 Summary: The Asus Transformer Mini T102HA is my favorite 10-inch Transformer at this time. 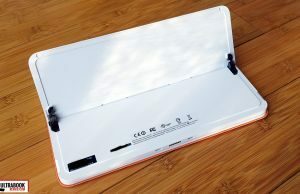 It's well built, it gets a good keyboard folio, an excellent screen and last for 10+ hours on a charge, but despite all these it's only a valid option for those users who need such a compact Windows running machine, who rather value battery life over performance and who don't mind paying extra for the form-factor. Read on for the long story. 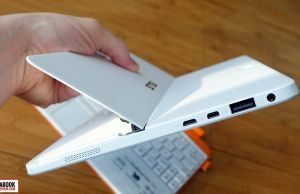 Many years ago the offer for 10-inch mini laptops was vast and netbooks were the thing everyone craved for, but then they grew unpopular with the rise of tablets and these days you can count the decent ultra-compact computers that run Windows on your fingers. 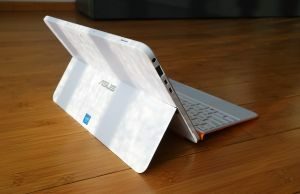 Among them, some of the better are the Asus Transformer T-series models. However, even these ones haven’t been updated in a while, but that’s about to change as of the Fall on 2016, with two new models scheduled for release: the Transformer Mini T101HA and the T102HA. We’ve spent some time with the latter and we’ll share our impressions in this article. 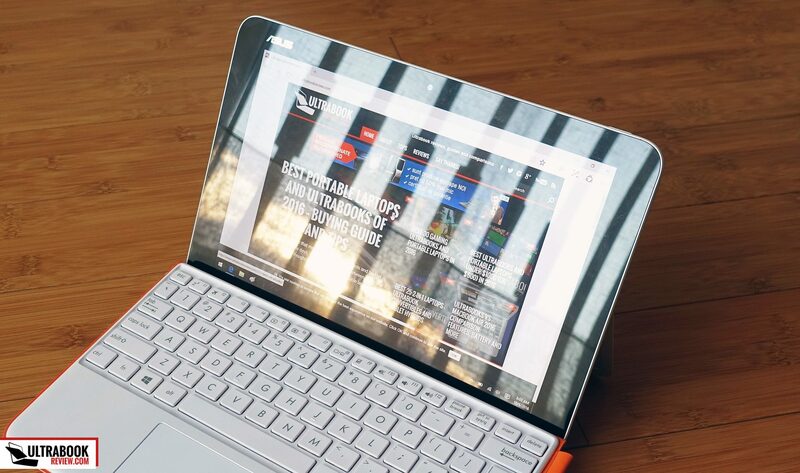 In very few words, the Asus Transformer Mini T102HA is a Windows tablet with a 10-inch touchscreen and all the hardware tucked behind the screen. It offers a digitizer with support for active pens, a kickstand on the back for versatile tablet use, a fairly good keyboard folio and decent performance with very basic tasks plus 6-10 hours of use on a single charge, all these packed in a well built and portable body and starting at around $350. The form-factor and the fact that there’s absolutely nothing utterly wrong with it are the major selling points of the T102HA, but it’s crucial to understand this device will only cater to certain needs, as its tiny screen and low-power hardware might not be what you’re looking for. Regardless, you’ll find out if this could be for you down below. 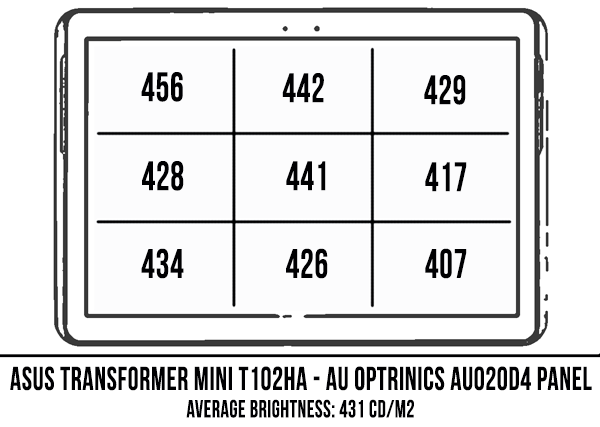 There are two important aspects that set the Transformer Mini T102HA apart from the 10-inch Transformer Pads available in the past: the form-factor and the choice in materials. 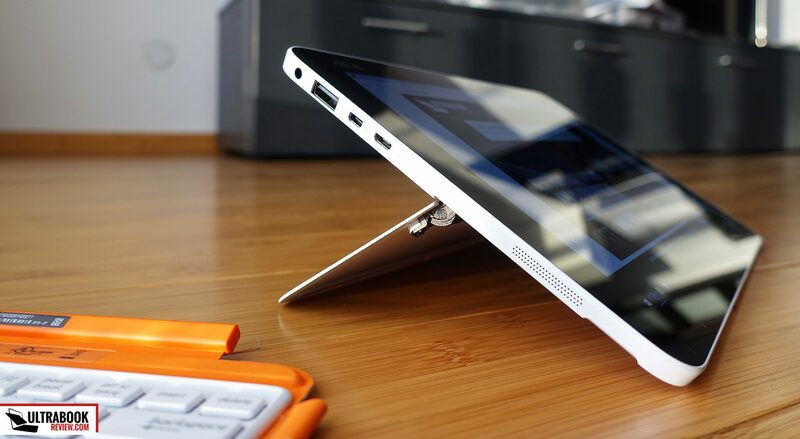 The T102HA is a tablet with a fully adjustable kickstand on the back, much like the Microsoft Surfaces or the Asus Transformer 3 Pro. That means it can rest on a desk or even on your lap by its own, and you can adjust its inclination to fit your needs at any given time. 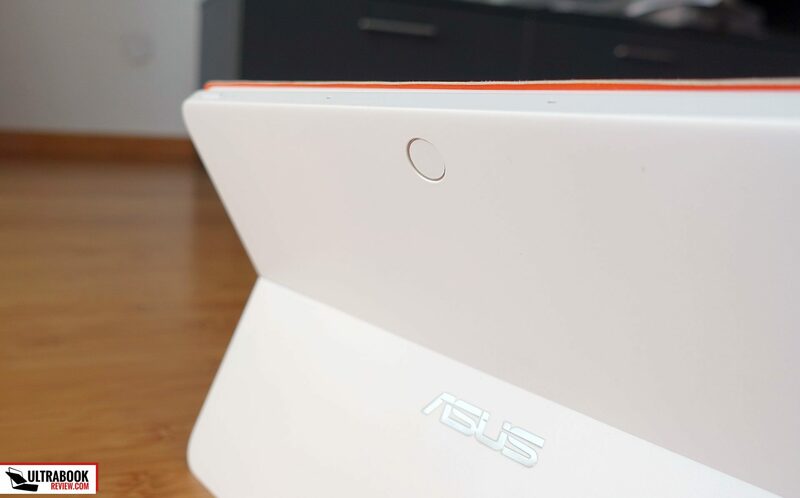 The kickstand can also act as a handle to grab the device from when using it in tablet mode and I’ve been holding it like this most of the time when reading or browsing. Just keep in mind this kickstand is made from a thin sheet of metal and it doesn’t feel very solid, so I don’t think it will handle abuse well. The hinges that support the kickstand in place are fairly well made though, but only time could speak of their reliability. 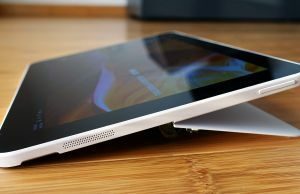 They are also stiff so don’t give in to the tablet’s weight, but yet I found it easy to open the kickstand and adjust it with a single hand. There’s a crease on each lateral that will help you open it up. I do have a nit with the kickstand though, and that’s the fact that it lacks any kind of rubber feet on the bottom and because it’s thin and sharp, I fear it might scratch the desk or table over time. Rubber feet would have also helped with the grip. 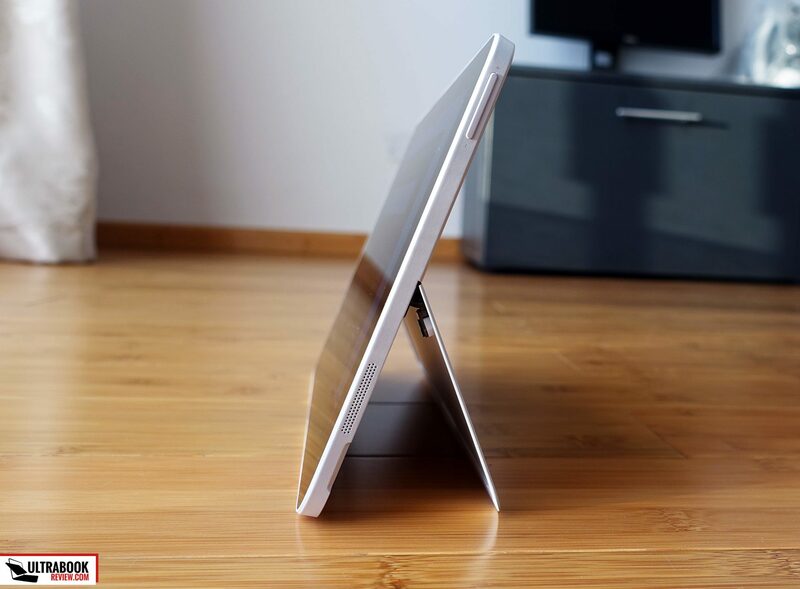 Even so, I’m a big fan of having a kickstand on a tablet, as it’s great for watching movies or reading content without actually having to hold the device in your hands. 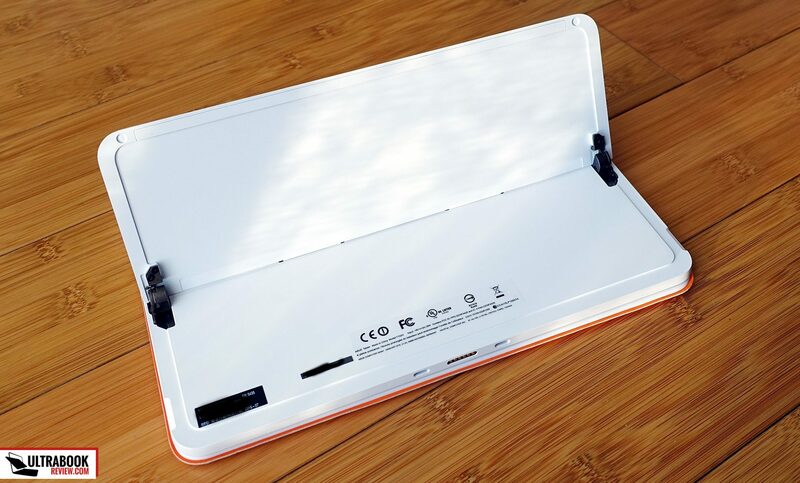 The T102HA also works fairly well in “laptop mode”, which is possible by attaching a keyboard folio that hooks up magnetically on the bottom edge, much like the folios on the Surfaces. 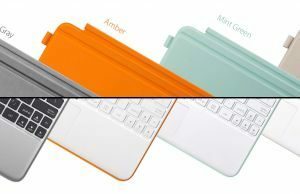 The tablet is available in two colors, Silver and White and the keyboard folios are also available in 4 different shades, as you can see in the pictures below. 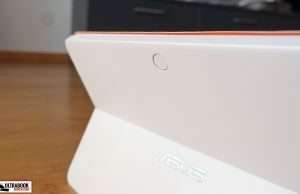 I do have to add that unlike most other Asus devices, this one gets a smooth and simple texture around the entire body, without any concentric surfaces or other flashy elements. The T102HA might not look as premium as other Transformers as a result, yes this finishing feels excellent in my opinion, doesn’t show smudges and I also expect it to age well. I wish more Asus devices would get this kind of exterior. On the practical side, the Transformer Mini is well made and feels solid in hand (with the exception of the kickstand, as mentioned earlier). Its edges are blunt and slightly inclined backwards, which combined with the rounded corners make the device comfortable to hold and use. 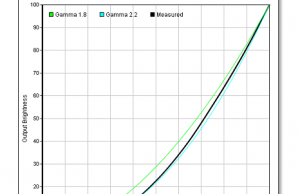 The low weight of around 530 grams also helps. 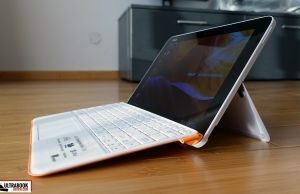 The Folio weighs around 270 grams on its own, for a total of roughly 800 grams (1.76 lbs) for the two. The footprint on the other hand isn’t very small for a 10-incher, as the bezel around the screen is fairly generous, especially on its left and right sides, but my impression is probably skewed by the fact that I’m using an iPad Air as my daily tablet and that one has a really compact bezel. When it comes to the IO, there’s a full-size USB port on this device, a 3.5 mm audio jack, micro-USB and micro-HDMI, all conveniently placed on the left edge. Personally, I would have preferred if they were not at the top of the tablet, but at the bottom, but that’s just a matter of aesthetics for me and Joey actually brings up a very good argument in the comments in favor of having them at the top: the ports are not in the way while you’re holding the device in hand. 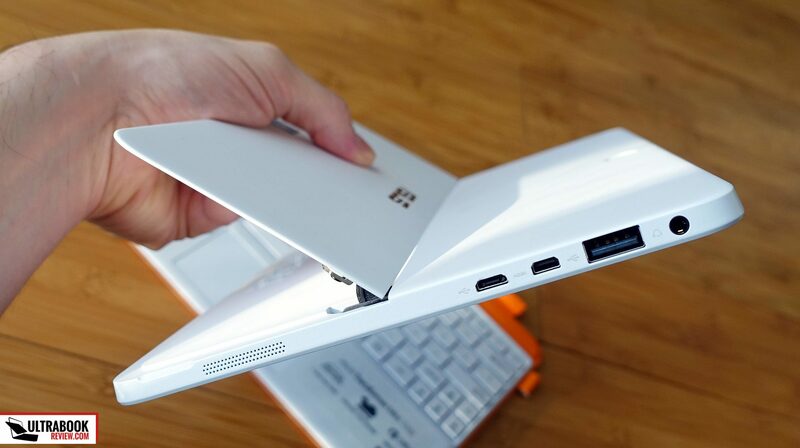 There’s also a microSD card-reader at the top, alongside two mic pins and the power button, while the volume rocker is placed on the right edge. As a novelty for this series, the T102HA also gets a fingerprint reader on the back, useful for quickly logging in into Windows. 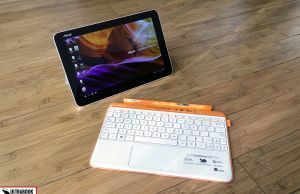 So to wrap up this section, the Asus Transformer Mini T102HA is well built, quite ergonomic in hand and comfortable to use as a tablet or laptop, with the Keyboard Folio attached. More about this is the next section. 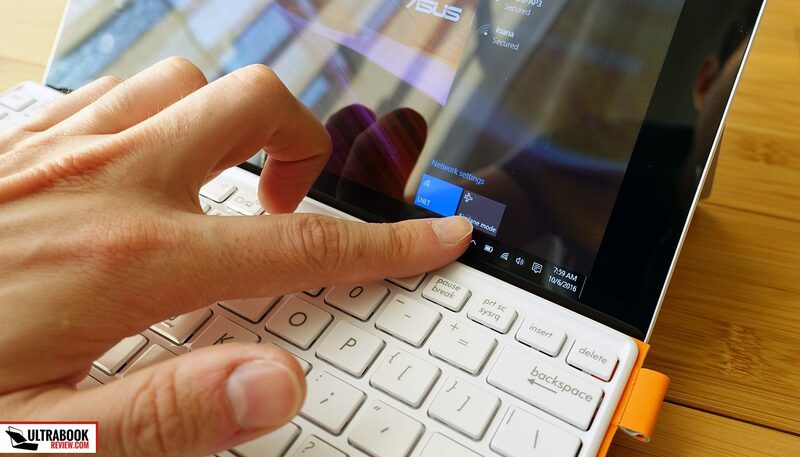 The keyboard folio Asus pairs this device with is pretty basic, just a deck with keys and a fair-sized trackpad beneath. 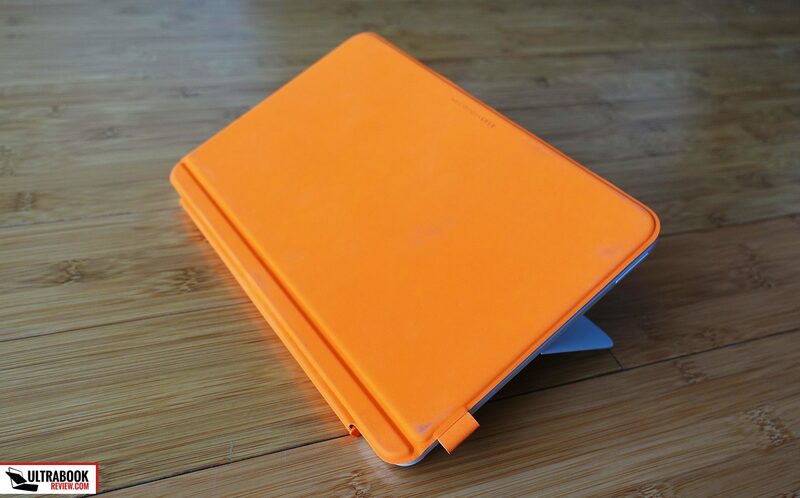 The exterior is available in 4 different outer colors (ours is orange), with the interior either white or silver (ours is white). 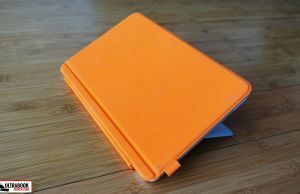 The outer part gets a rubbery-canvas like texture, while the interior is made of smooth plastic. The tablet and the folio hook up through a physical connector and the process is assisted by some very strong magnets. Strong enough that you can easily grab the two by either side and the connection won’t break (proof below). 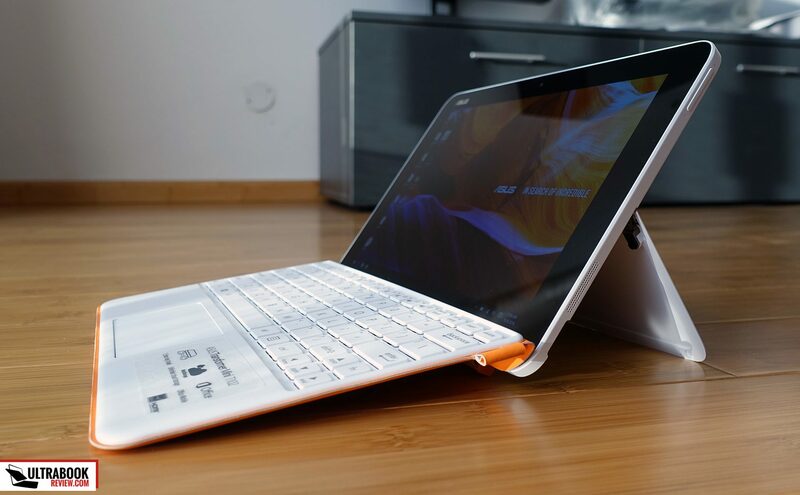 The folio can be used in two ways, either flat on the desk or in a slightly raised position, which creates an inclined typing angle, just like on the Surfaces and the Transformer 3 Pro. The folio’s chassis is pretty solid. There’s some flex when hitting the keys in the raised position, but overall I don’t think that’s going to be something users will be bothered by, especially since the overall typing experience is surprisingly good. 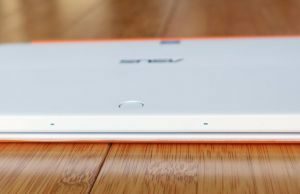 It’s also worth adding that the folio gets a compact hoop on the right side, which I believe is made to hook up the Asus Pen on. It was not included by default on this test unit though, so I can’t really tell you anything about how it works, and from what I know so far it’s not going to be included on the final retails units either, yet that might differ from region to region. 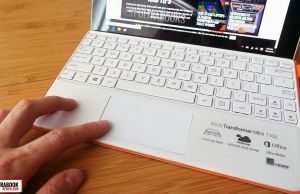 Back to that keyboard, it gets a full-set of keys with a standard layout, however the keys are small, like on all other 10-inch devices, so those of you with larger hands will struggle with them. 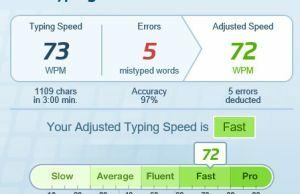 Mine are about average and I was able to type quite fast and accurate, with little accommodation time required, but I still had some trouble with the directional keys, which are really small and cramped. The keys travel 1.5 mm into the frame and are quite springy, but they could have been a little firmer, as some hits aren’t always registered if you’re not hitting the keys the right way (with enough force and in the middle), which will probably happen quite often due to their small size. 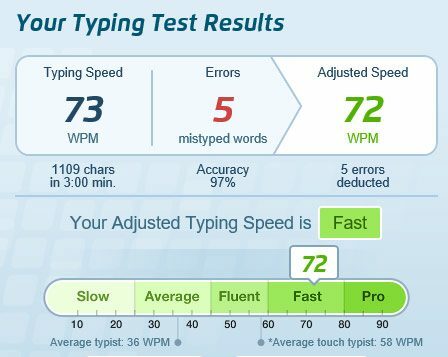 Even so, that didn’t impact my performance much, although I was actually expecting it would and when I took the typing-test I was surprised by the results. 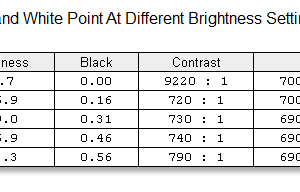 One other aspect to keep in mind is that this keyboard is not backlit. 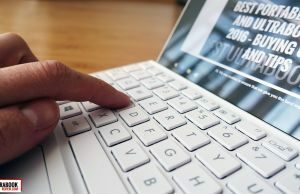 The trackpad is wide enough, yet short, so again those with bigger hands will struggle with it. 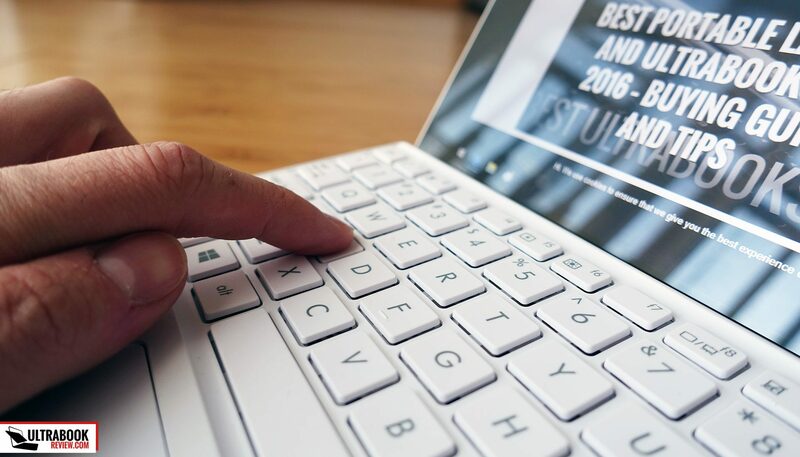 Its surface is smooth and performs decently well with daily use and basic gestures, although the cursor gets jumpy from time to time and the physical buttons are somewhat stiff and clunky. 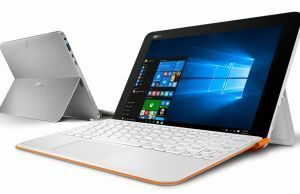 Asus put a 10.1-inch display on the Transformer Mini T102HA with a 16:10 aspect ratio and an IPS panel with a resolution of 1280 x 800 pixels. This is a pretty basic screen, the kind we’ve seen on most 10-inch slates in the last 2 years or so, but it’s a decent pick nonetheless. 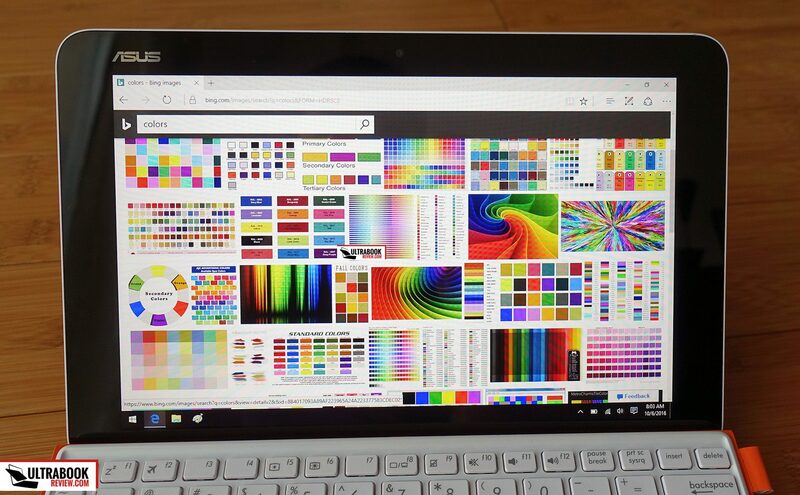 I’ve measured a brightness of around 440 nits in the middle, higher than the 400 Asus advertises on the official page, very good contrast and above-average color accuracy, especially when calibrated. 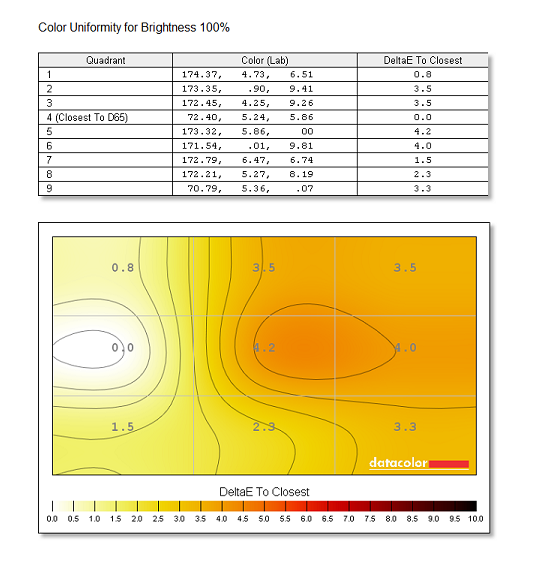 The color gamut coverage is pretty basic though, so this isn’t a great option for professional work, but you can use our calibrated ICC profile to get the most natural colors this panel is capable of displaying. 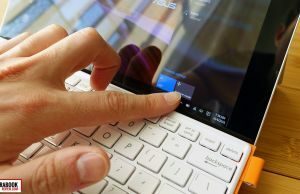 I’m mentioning this because the display actually includes a digitizer and supports the Asus Pen (and probably others). I’d reckon an NTrig driver is used, but I actually didn’t have an Asus Pen included in this test bundle and couldn’t test it out. I can tell you that the touch functionality works otherwise great though. Just keep in mind that when having the keyboard hooked up in the raised position it’s going to nearly cover the bottom of the screen and make it a bit difficult to reach the buttons and options placed there with your fingers. 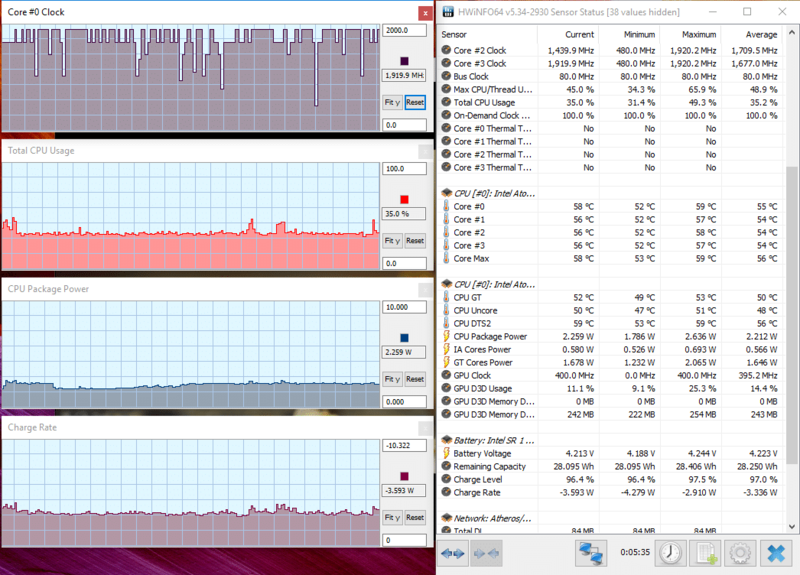 The picture below should help you understand what I mean. 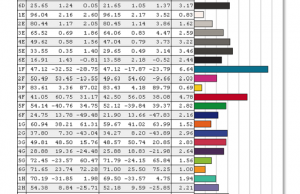 Those of you interested in more technical details will find them below, measured with a Spyder4 Elite. 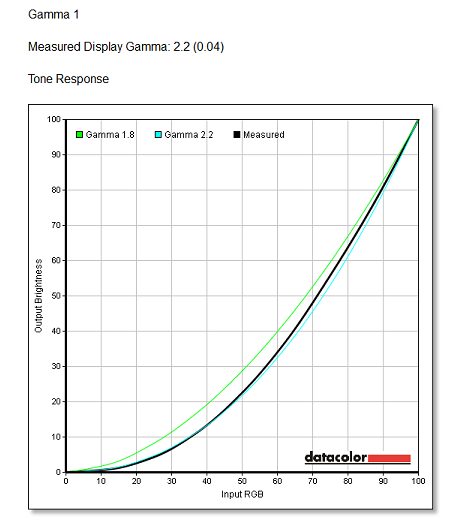 Average DeltaE: 2.35 uncalibrated, 1.64 calibrated. Overall I feel this is a surprisingly good screen, but the resolution is a bit low by today’s standards and if you’re used to higher density panels you’ll notice the pixels on this one. 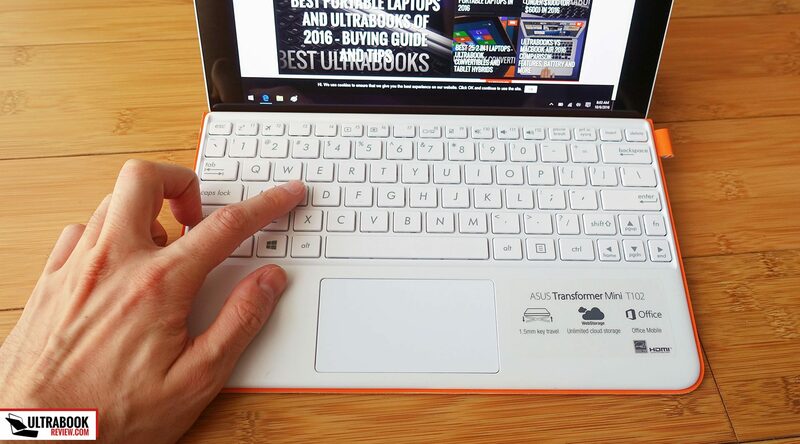 The hardware is the most tricky part of the Transformer Mini T102HA, which is built on an Intel Atom X5-Z8350 processor, with 4 GB of RAM and 64 GB of eMMC storage on our test model, while other versions might actually come with 2 GB of RAM and up to 128 GB of storage space. This is an old platform (Intel Cherry Trail T) that was launched in Q1 2015 and hasn’t been replaced ever since, as its successor (Willow Trail) was cancelled. It’s also a platform designed with efficiency in mind, which means it requires little power, but doesn’t offer much in terms of performance either. 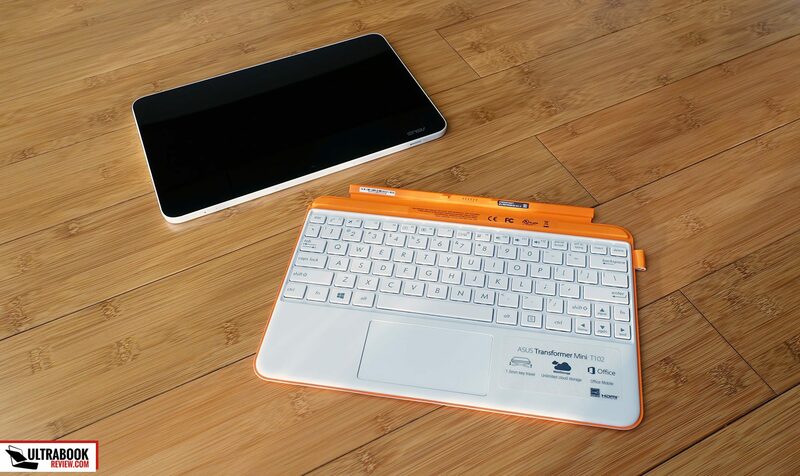 In other words, the Transformer Mini T102HA is pretty much a computer made for simple tasks and little to no multitasking. 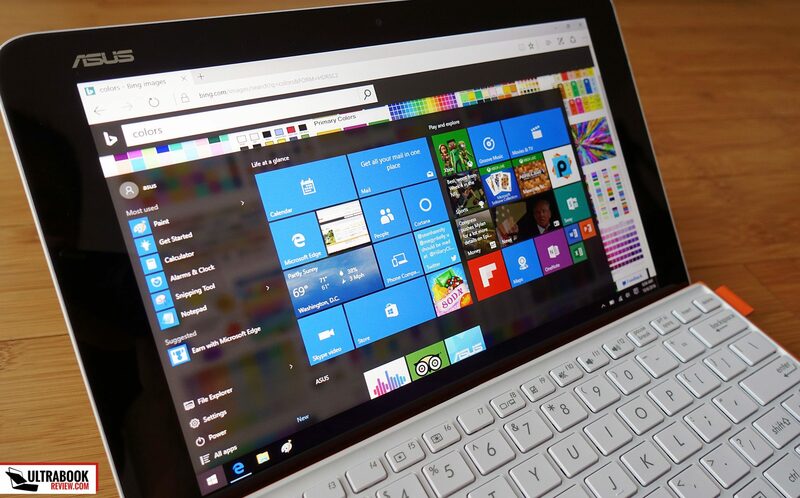 It’s going to handle most types of video content well, text-editing in Office or Google Drive, Youtube, email and of course browsing with a few different tabs opened simultaneously. 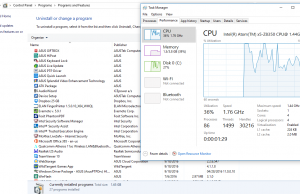 However, multitasking is problematic, so don’t expect to be able to smoothly run multiple programs at once, load them quickly or switch between them without stuttering. 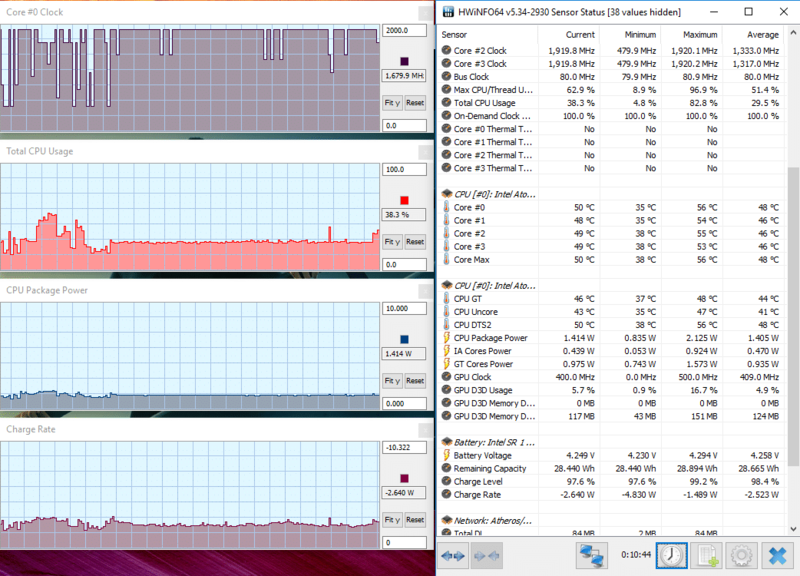 The X5-8350 CPU does get four cores, but that doesn’t help with multitasking since each thread offers limited processing power. So bottom point, if you understand and accept these aspects and stick to the basics when using the T102HA you should be happy with this little fellow, so just make sure you’re having the right expectations if you don’t want to end up disappointed. 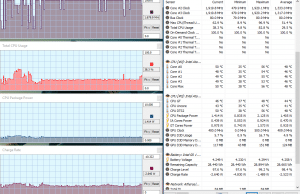 Still, I don’t recommend getting a configuration with less than 4 GB of RAM or 64 GB of storage, because neither are upgradeable and these are pretty much the minimum requirements to be able to run Windows 10 properly. 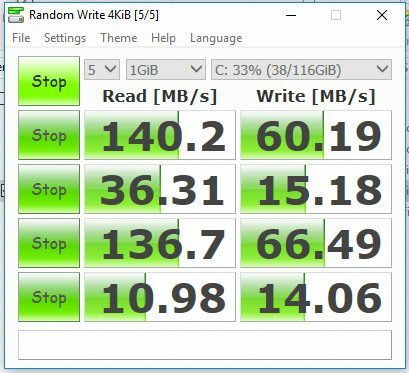 The storage is a little slow, since Asus uses an eMMC solution, but this only affects software install times and to a small extent, loading times, plus you can’t really expect an SSD in this price-range. Of course, the 64 GB eMMC won’t offer much spare storage space, but you can use a microSD card to store your movies, photos and music on. 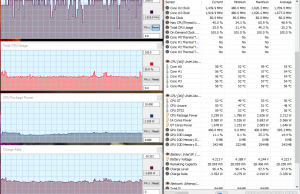 Just don’t install programs on the card as they will load awfully slow. 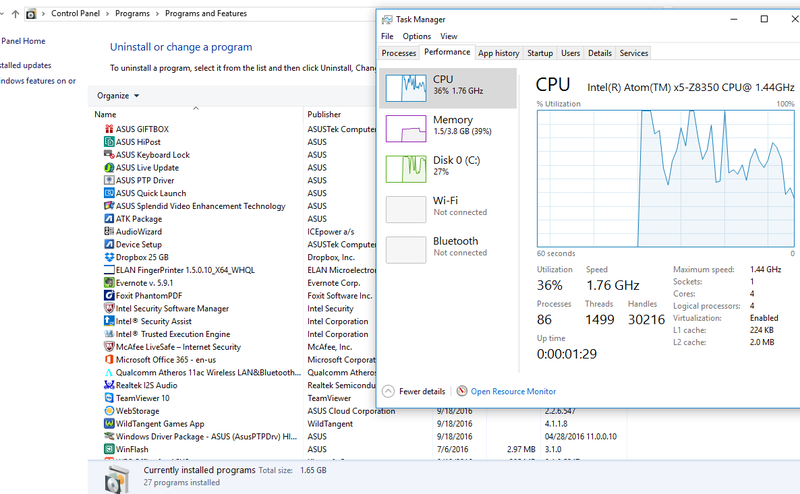 One thing I must note is that Asus puts a lot of bloatware on this device which takes a major toll on performance, so make sure you get rid of it or better yet, do a clean Windows install once you get your Transformer Mini. 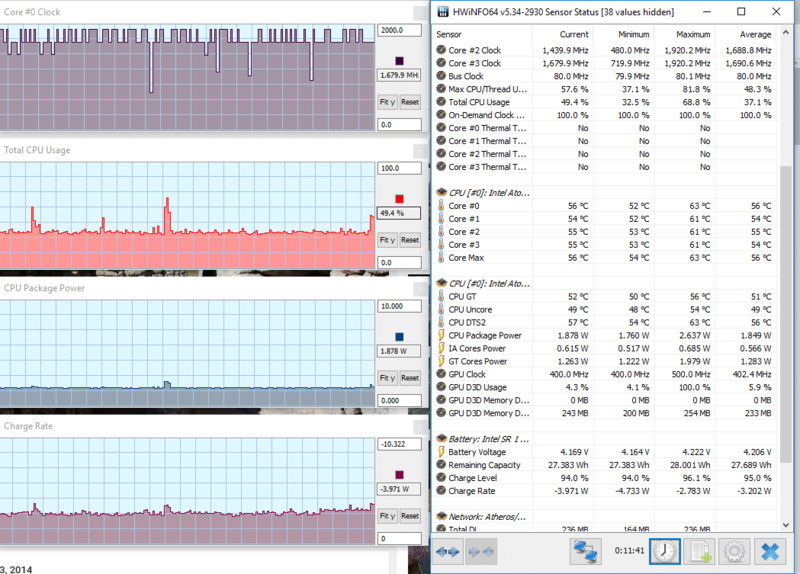 Anyway, you’ll find some benchmark results below, if you’re interested in such technicalities, and also some HWInfo print-screens showing details on performance and temperatures in various daily use scenarios. Take the numbers with a grain of salt though, we tested a pre-production sample and the final retail models should actually score higher. 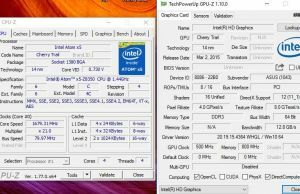 CineBench R15: OpenGL 11.71 fps, CPU 90 cb, CPU Single Core 28 cb. Before we get to the next section, there’s a small rant I must add. 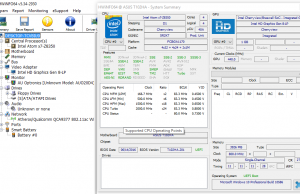 I believe Asus should have went with the Atom X7-Z8700 processor on this device, as that is the fastest Atom processor available right now and is only merely more expensive than the X5-Z8350 they actually went with. 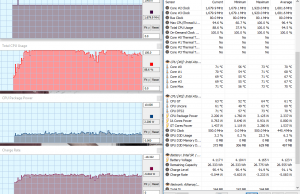 It wouldn’t have made a major difference in terms of performance, but the bumps in CPU speeds and GPU processing units, plus the support for dual-channel memory, would have mattered, and every bit of speed increase counts in this segment. 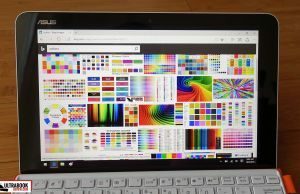 Microsoft use the X7-8700 in their Surface 3 (we reviewed it here, in case you’re curious if it’s any good), which is actually one of the T102HA’s main competitors, despite the fact that it was discontinued a while ago. We’ll talk more about it in the final section of the article. 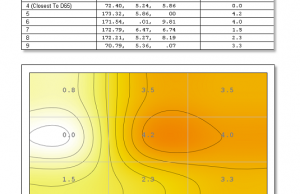 While Atom platforms do not excel in terms of performance, they are passively cooled and despite that, actually keep to very low temperatures in most use scenarios. On top of that, our Transformer Mini T102HA wasn’t hindered by any coil whining or electric noise, so it was actually dead quiet. 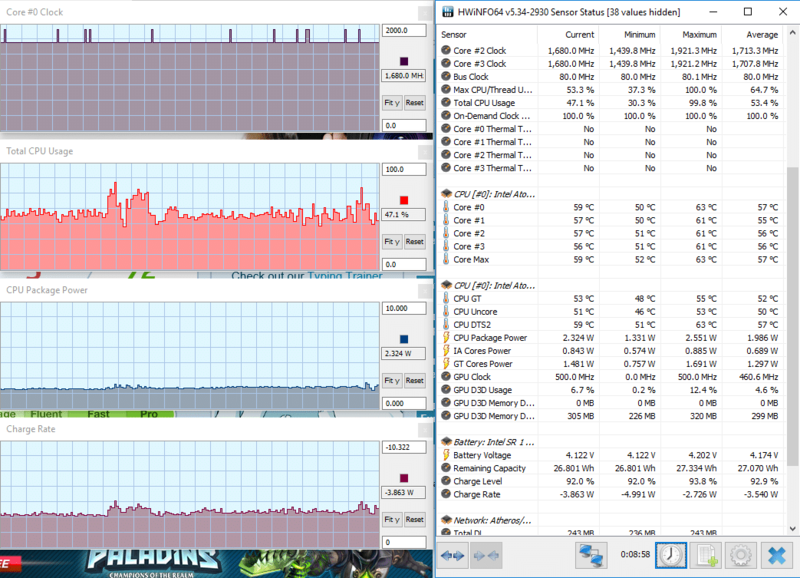 As for temperatures, I’ve only measured them in basic activities like watching movies or browsing, and the results are below. 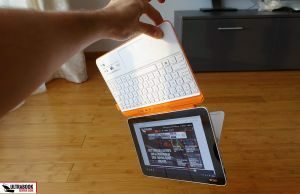 You could expect certain surfaces to get a little warmer with more intense use and reach around 35-36 degrees Celsius, but even those are more than OK when holding the tablet in hand. 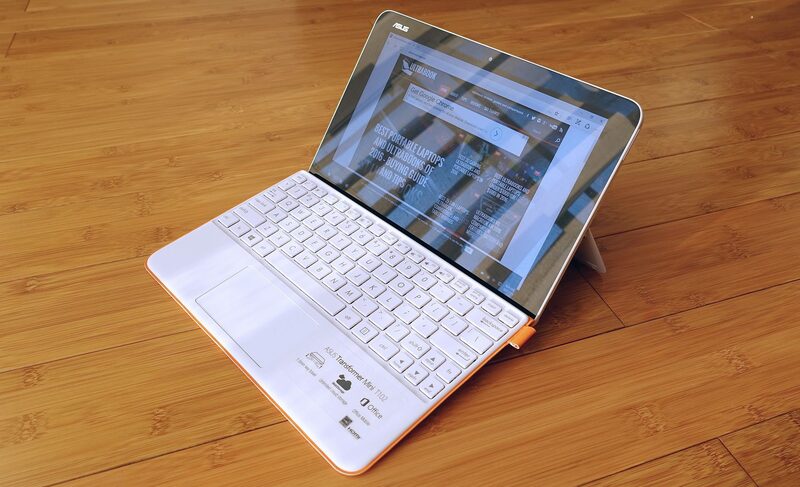 The keyboard folio rests much cooler, around 25 Celsius in our tests, since it doesn’t include any kind of hardware. 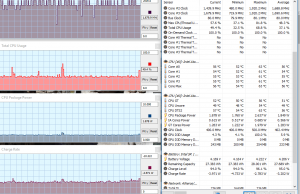 As for temperatures under load, well, I haven’t actually tested these simply because this computer is not meant for gaming or other demanding applications, but I wouldn’t expect the exterior to go far past the 40 degrees mark. 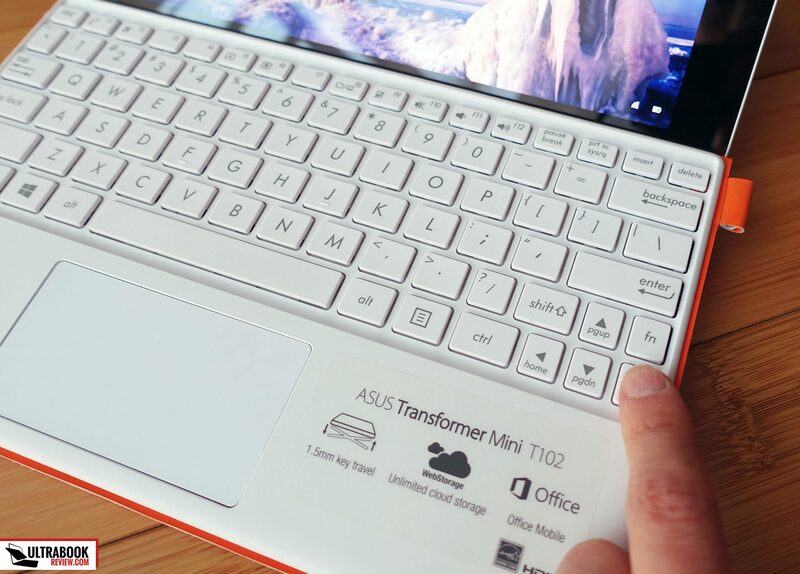 Connectivity wise there’s Wireless AC and Bluetooth 4.1 on the Transformer Mini T102HA. 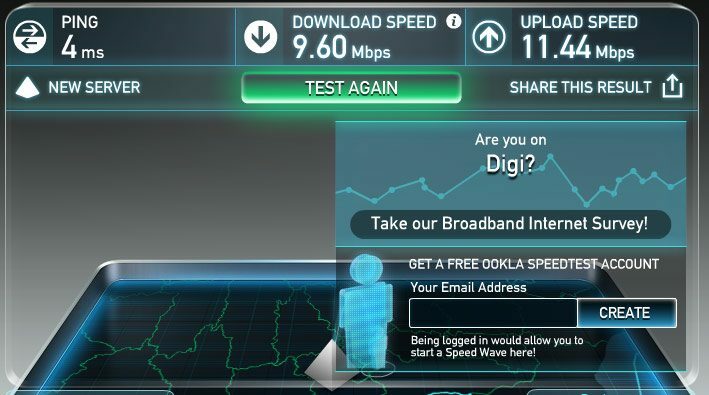 The wireless connection is slow by today’s standards though (a Qualcomm Atheros QCA9377 module is used) even right near the router, but that’s not necessarily a bottleneck in daily use and you’ll only notice it when downloading large files of the Internet. 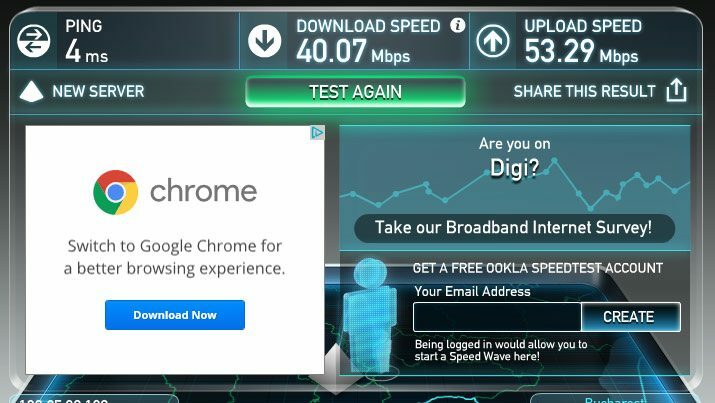 The speeds and signal strength drop significantly at 30 feet with 2 walls in between in my apartment (with very thick walls), but not to the point were the connection is no longer usable with browsing of video streaming. The audio on this tablet includes two separate speakers firing through the grills on each lateral side. They’re moderately loud (around 86 dB in our tests at max volume) and they don’t sound very bad with the Music profile selected in the included AudioWizard application. However, the speaker grills are quite easy to cover and muffle with your hands while using the tablet in Landscape mode, and on top of that the left speaker was defective on our test unit and buzzed at volumes above 70%. Hopefully that’s an isolated issue with our model and not something you should worry about on the retail versions. 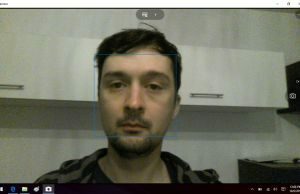 One final aspect to look at is the camera, but there’s not much I can tell you about it, since it’s ordinary. It takes decent pics and videos in good light, fairly washed out though and with poor details, and quite grainy ones with indoor lighting, as you can see above. Still, it will do for occasional Skype calls and Hangouts, and the mics placed on the top edge do a decent job at capturing voices. There’s a 30 Wh battery on the Mini T102HA, which might seem small, but don’t forget this is a compact 10-incher built on an Atom platform, which means it’s capable of squeezing many hours of use out of this battery. 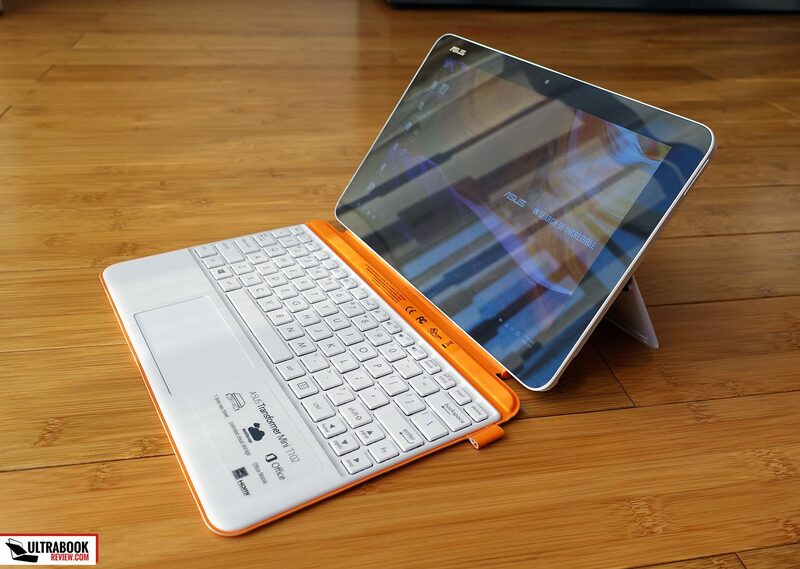 More details below (screen at 30% – 120 nits and the keyboard folio attached). 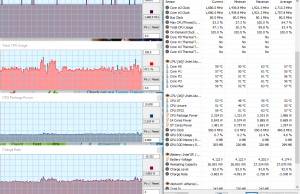 5 W (~6 h of use) – heavy browsing in Edge, Balanced Mode, screen at 25%, Wi-Fi ON. 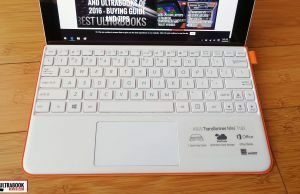 The keyboard eats around 0.75 W when connected, so you can actually get way longer battery life when using the tablet alone for watching movies or browsing. The Transformer Mini T102HA still charges via microUSB through a 10W charger, and that’s really annoying because charging times are very long, somewhere between 3 to 5 hours if you’re using the device while it charges. 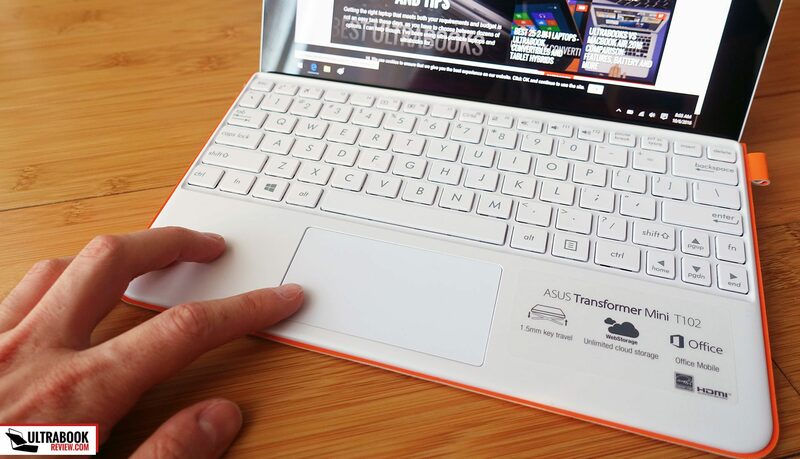 I sure hoped Asus would change this, especially since it’s been one of the major complains people had on the previous Transformer Pads. The Transformer Mini T102HA is expected in stores in November 2016, with prices starting at $349 in the US and 329 EUR in Europe, based on what we know right now. All configurations are built on the Atom X5-8350 processor, yet there will be versions with 2 or 4 GB of RAM and 64 or 128 GB of SSD storage. 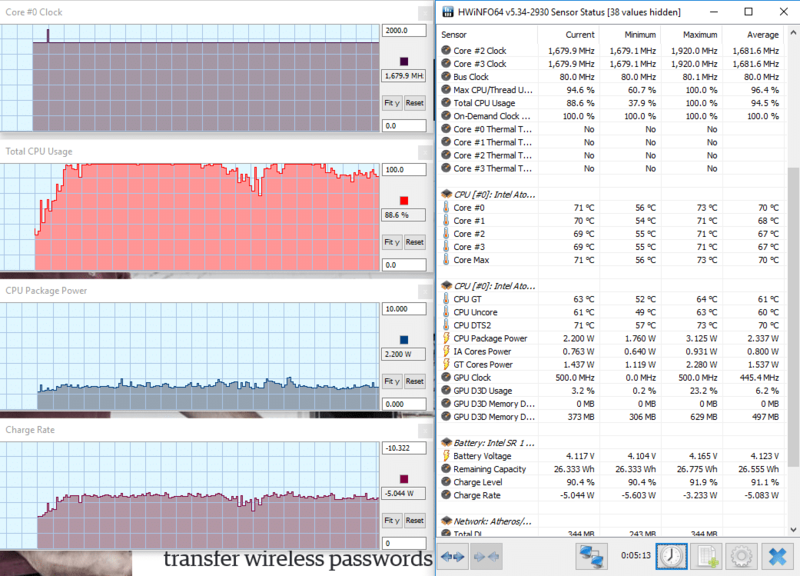 You should stay away from those with only 2 GB of RAM of you plan to keep this for a few years. The top option is available for preorder at around $399 at the time of this post. 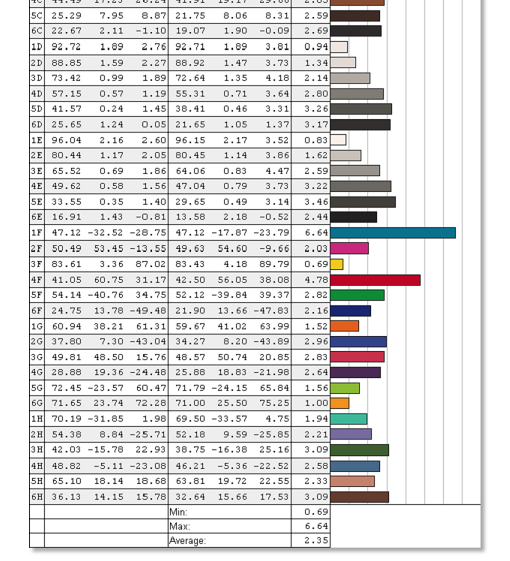 Follow this link for more details on the available configurations and up-to-date prices. 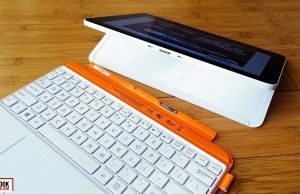 Design wise, the T102HA is in my opinion the best 10-inch Transformer Asus created so far, and that’s because I prefer its form factor with a kickstand and a keyboard-folio to that of most other T100s, with a keyboard dock, like the T100HA or the newer T101HA. 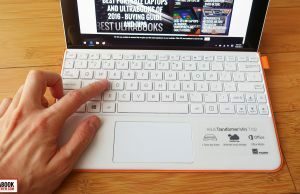 Yes, these latter ones are perhaps more lappable, more comfortable to use for typing on the lap, but the only way you can use them as tablets is by holding them in your hands, that’s why I think the T102HA clearly wins in tablet mode and is overall the more versatile option. There are two aspects that could break this for you. 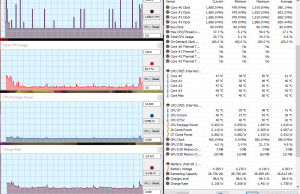 The first one is the platform and the daily performance. 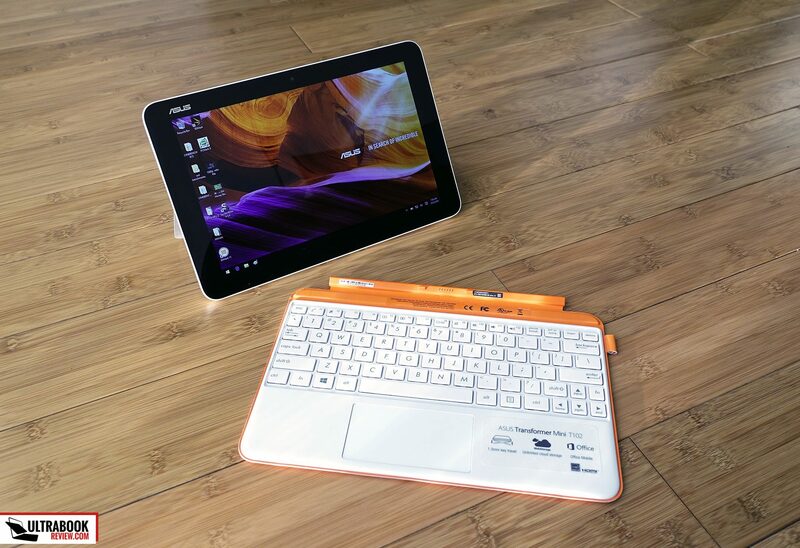 If you expect this to be as snappy as an iPad or a modern Android tablet, you’ll be disappointed. 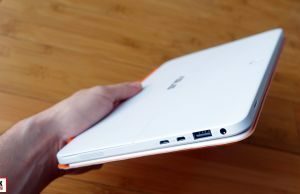 It can handle most daily activities, but it’s not as responsive in launching programs and performing tasks, so you’ll need to be patient with it. The second is a little more sensitive: the price. 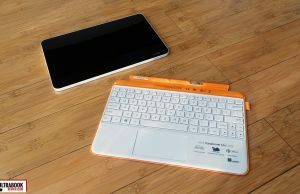 The Transformer Mini T102HA isn’t cheap for what it is, at around $400 for a top-level configuration (4 GB RAM,128 GB storage), especially when compared to the Transformer T101HA, which sells for around $300 for decent specs as well(4 GB RAM, 64 GB storage). So you’re pretty much paying $50 to $100 for the form-factor and I’m not sure it’s worth the difference, despite the fact that I actually like it a lot. 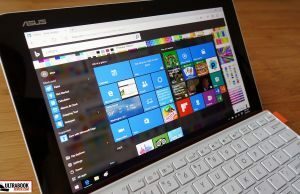 $400 can also get you a Microsoft Surface 3, another long-lasting device built on an Atom platform, but with a slightly bigger screen, a little faster hardware and overall sturdier construction. 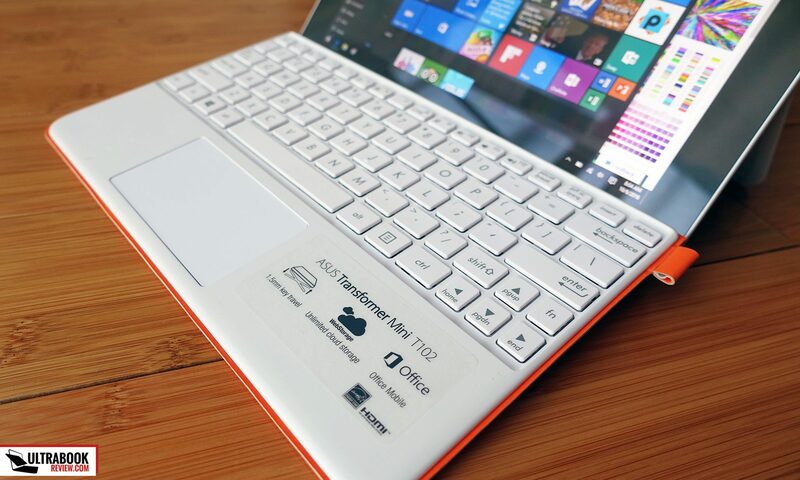 Just keep in mind the Surface 3 doesn’t come with a keyboard by default, so you’ll have to spend extra to get it. 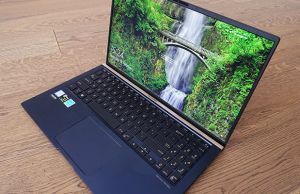 $400 is also way too close to devices like the HP Spectre X2 or the Lenovo Miix 510 though, which are available with faster hardware (Core m3 CPU, 4 GB RAM, 128 GB SSD) for as low as $450-$470 these days and offer a much improved daily experience. They’re not as compact and don’t last as long on a charge though. 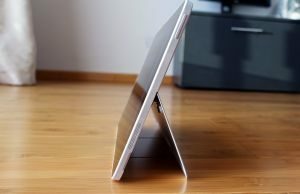 You’re willing to spend around $50 to $100 more than you’d spend on other 10-inch devices with similar specs and features for the form-factor and the design. 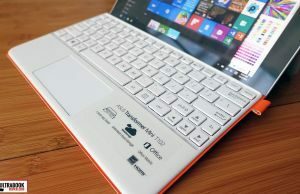 Everyone else should also consider the Asus Transformer Mini T101HA instead, the Microsoft Surface 3, the HP Spectre X2 or some of the other ultra-portables 2-in-1s listed in this and this article. With that in mind we’ll wrap this up. 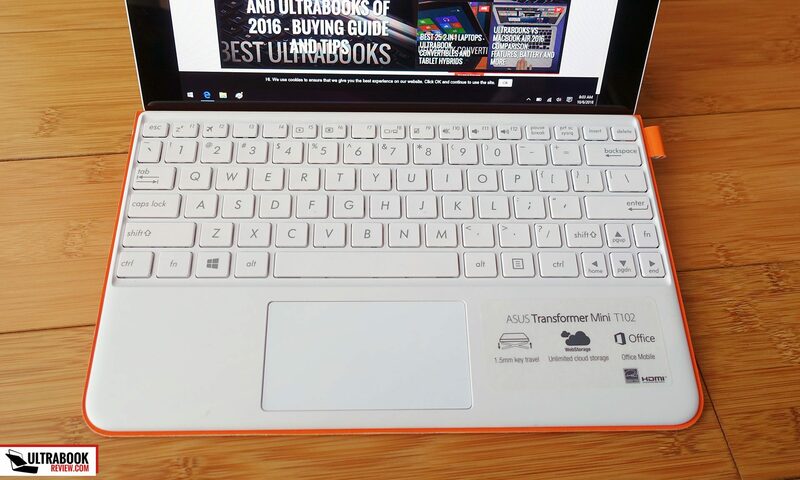 Let me know what you think about the Asus Transformer Mini T102HA and get in touch in the comments section below if you have any questions or anything to add to this article. Thanks for the review, this is a great website. About your comment that you would prefer the I/O ports on the bottom of the left side, rather than the top of the left side, I strongly disagree. 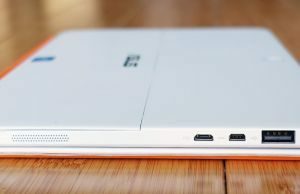 One common major design flaw that I find with some tablets and 2-in-1’s is that they place ports/plugs on the lower sides and this really interferes with holding the tablet. This is especially bad when the ports are on the lower left side – exactly where most right-handed people will want to hold the device. Surface Pro line got this right by moving the ports to the top sides and making a flat-sitting reversable-orientation power plug that doesnt stick out into the hand like most power plugs. 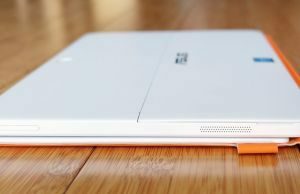 Especially with the often relatively the low running times and sometimes slow charging times, I think they should be designed for comfortable tablet-use whilst being plugged in to power cables. Hmmm, that makes sense, never thought about it, mostly because I pretty much never use my tablets while charging (the iPad takes hours too) and also rarely actually hold them in hand. The reason I would want them at the bottom is because I don’t like having the charger and HDMI cable so visible and in the way as they are right now, but that’s just a personal preference and a matter of aesthetics, your argument actually makes more sense in practice and daily use. PS: I’ve updated that part and added your point of view. Thanks for taking the time to share it with us. I think this detachable is perfect but the price is a deal breaker, i would pay this around $250-300 NOT $400. Shame you didn’t have the stylus to test, that’s one of the most critical features for me. Otherwise it’s about what I expected, so no disqualifying things in the review here for me. 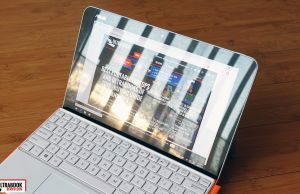 The Surface 3 was only available for a short while where I live, and at a *much* steeper price than what this is listed for, so while I wanted one, it just wasn’t realistic, and this might fit the bill. 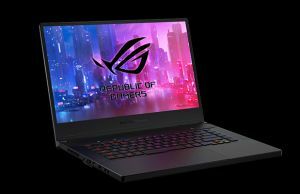 I really hope Asus releases this with 4GB in Australia. 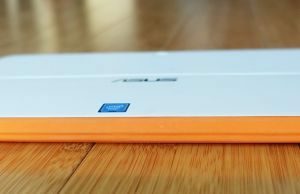 2GB RAM is just a flat-out deal breaker for me and many others, but unfortunately Asus has a history of only releasing 2GB versions of their devices in this market segment in Australia. 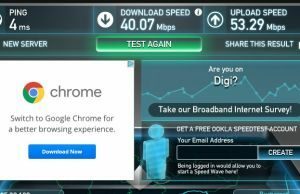 It’s almost 2017, enough with the hobbled 2GB machines. Right, my mistake, thanks for the heads-up, I’ve addressed it in the post. 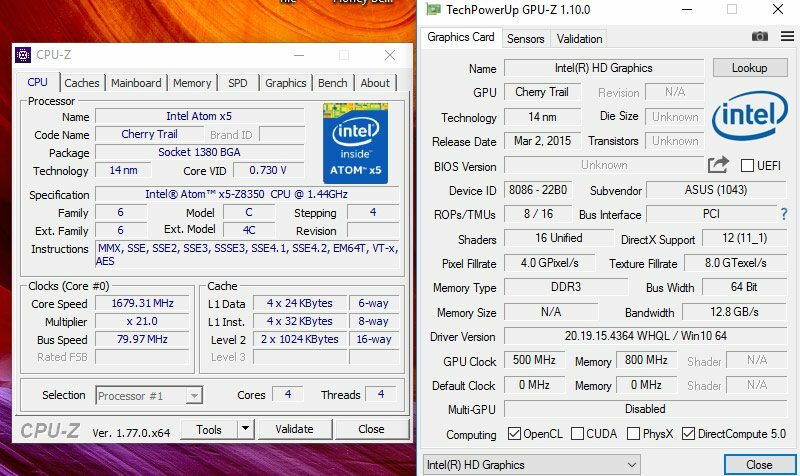 That Intel spec page also says the CPU was launched Q1’16, not Q1’15 as in your review. Yes, the 8350 was released in Q1 2016 like you’re saying, but is based on the same platform that was initially launched in 2015. I will admit that I might have liked it better if it had been windows based which wasn't really happening much at the time I don't think. 1. Do you think the WIFI on this unit is much better. 2. Is it possible to wipe mine off and put windows on it? 3. 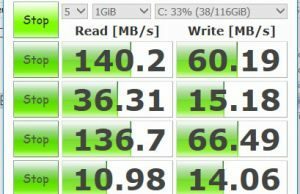 Will my dock work on newer ASUS windows based unit? I did like having an extra battery built into the keyboard dock. <I realize that I have gone mostly off topic. I would be grateful for a response regardless of whether you post this or not>. thanks! 1. It should be, you have the results I got on my unit in the article, at 30 feet with two thick walls in between. 3. No, the new units have a different physical connector. Microsoft currently has the 64gb version on sale for $279. 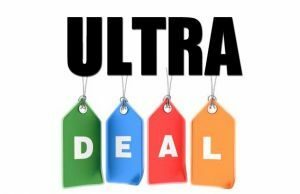 At this price point, this is perhaps the best tech deal of the holiday season. 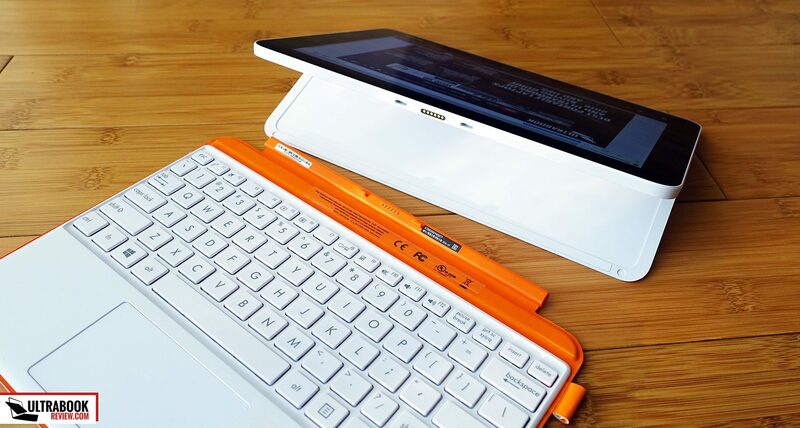 Especially considering it comes with the keyboard and active stylus. 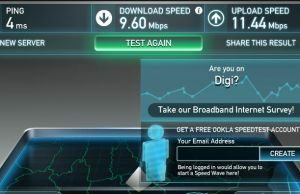 I really find it very inconvenient because like now I am trying to use the internet but the wifi isn't connected while my mobile phone is already connected. I shut down the tablet after troubleshooting and when I turned it on the wifi icon is gone and it is saying that windows did not detect any networking device. How can I fix this problem? 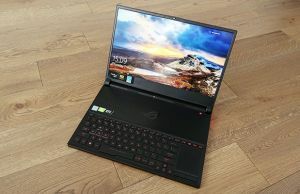 Unfortunately ASUS is moving backwards with this model in comparison to older models. 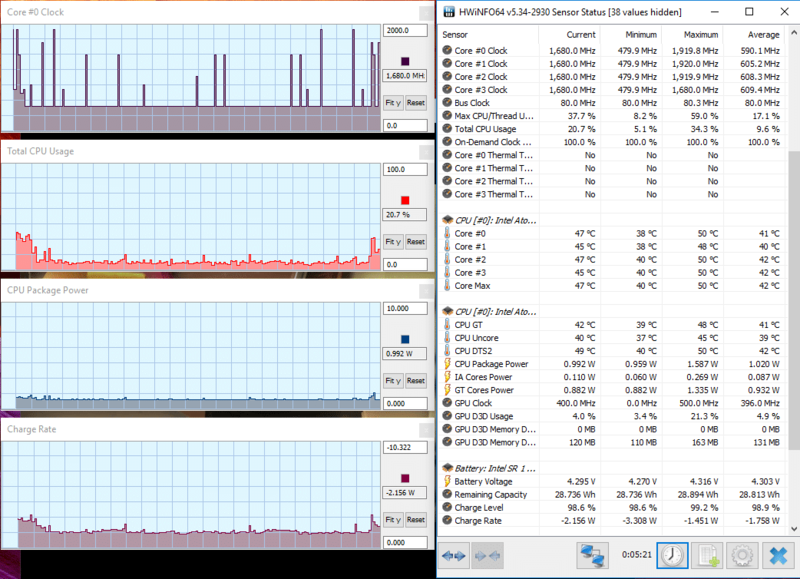 Yes, there are some upgrades but the majority of the core components are unchanged. I currently have a T100HA and recently purchased the T102HA. 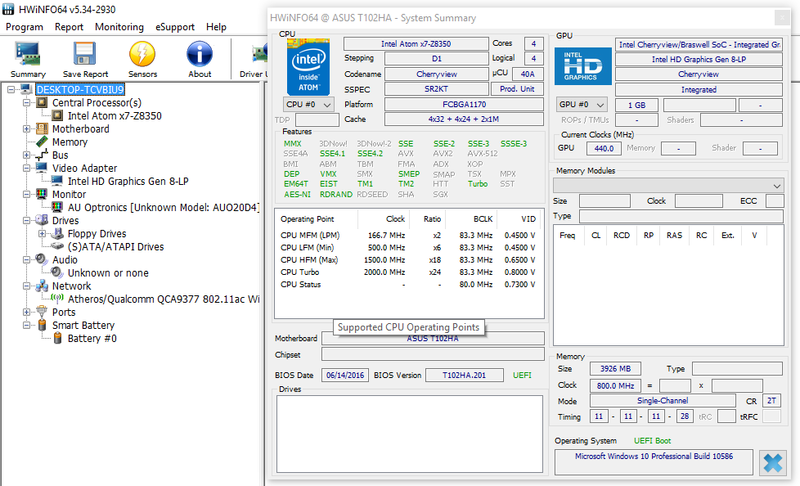 The T102HA has the same 4g RAM, the same processor, the same screen and both have Windows 10 Home. 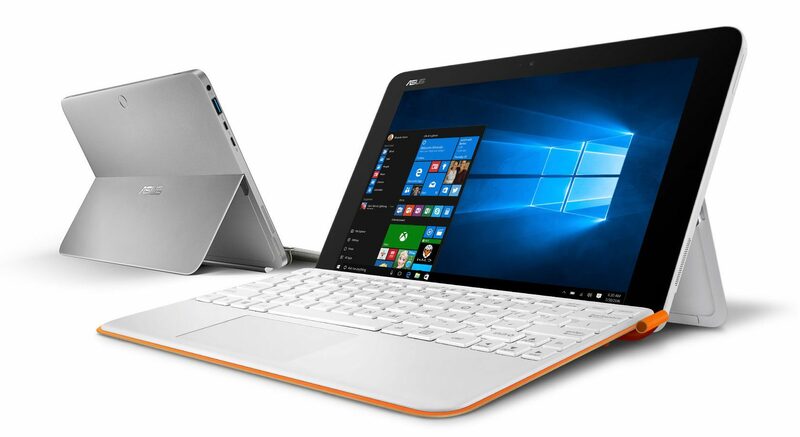 ***The item that I find funny is that even on the ASUS website it indicates that this item has Windows 10 Home installed, but on the same line it states that ASUS recommends Windows 10 Pro*** though there is no option to order a version with Windows 10 Pro. Some may not think of these changes as a major issue but if I would have done more research I would have reconsidered purchasing this model because of these changes. I may still give the T102HA to my wife and keep the T100HA for myself. 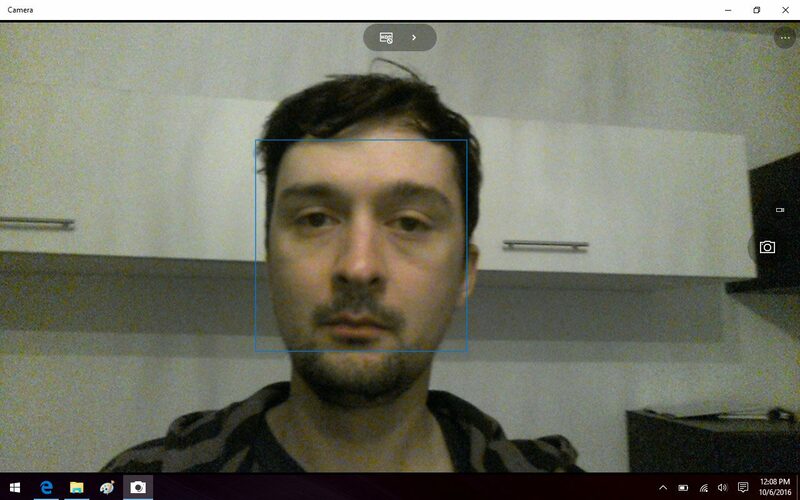 Going backwards: Although it wasn't the best quality, ASUS opted to remove the rear-facing camera, so in order to take a picture with this model you have to turn it around to use the selfie/chat camera to try and take a picture. 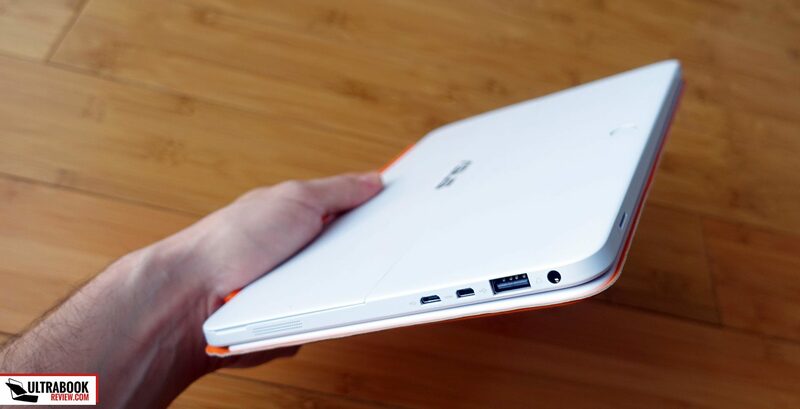 They also eliminated the USB Type-C connector from the T102HA. You can only change the viewing angle of the screen by using the kickstand or holding it in your hand. 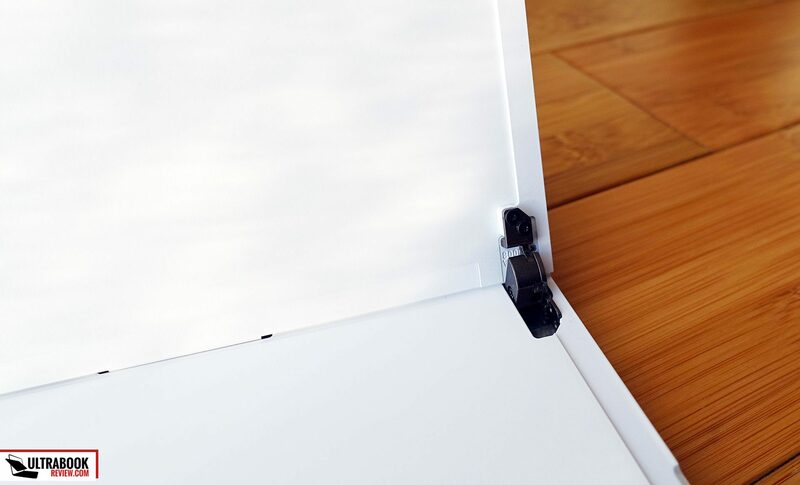 The T100HA model has a much stiffer hinge assembly which holds the screen in place at any angle. Upgrades: from 64g storage to 128g (although only 116g is usable) Though not really a major upgrade because both models accept USB thumb drives and both have a microSD card slot. They included a Pen/Stylus with the T102HA which is very responsive and accurate however, the pen holder is a joke. It does not support the pen as it only holds it in place by the clip, so the Pen just dangles and is prone to catching on items because it just flops around. 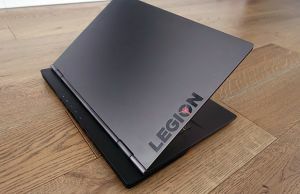 You should also consider that we haven't seen much in terms of platform updates at this level, as Intel no longer develops this low-end hardware, and that's one of the main reasons hardware wise not much has changed from the T100 to the T102.